I downloaded and installed the latest version of Project Ironfist (26/11/16) and installed it to C:\Program Files (x86)\GOG.com\Heroes of Might and Magic 2 GOLD. 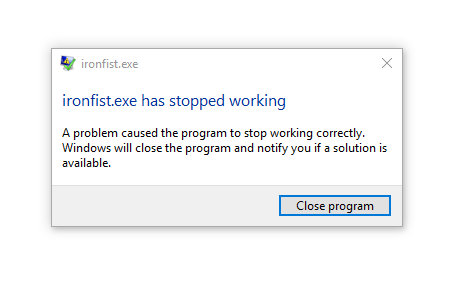 Whenever I launch ironfist.exe, the game crashes instantly. Prior to this, I have had no problems with HoMM II. Should this have been installed somewhere else? I'm running Windows 10 with the GOG version of HoMM II Gold. Also, the contact section of ironfi.st is broken -- I tried sending this as a support ticket but all it says is: "There was an error trying to send your message. Please try again later." It should be installed to the same folder as your Heroes II install. If you open that folder, you should see "ironfist.exe", as well as many other files for your normal Heroes II installation. 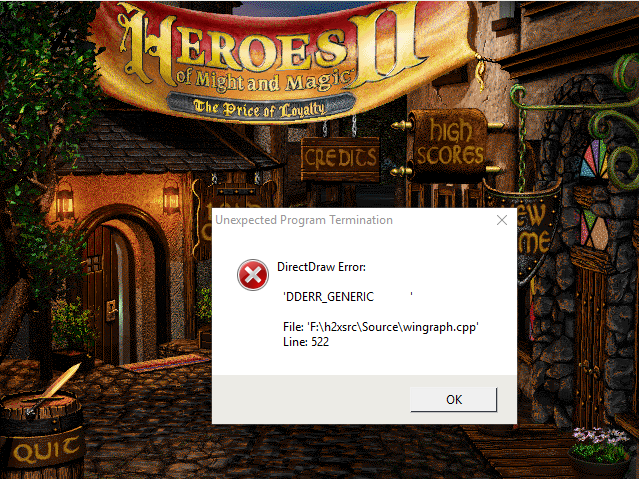 If you have the Windows version of Heroes II, you should also see "HEROES2W.exe". If you have the GOG.com version, you'll see various things like the GOG launcher. 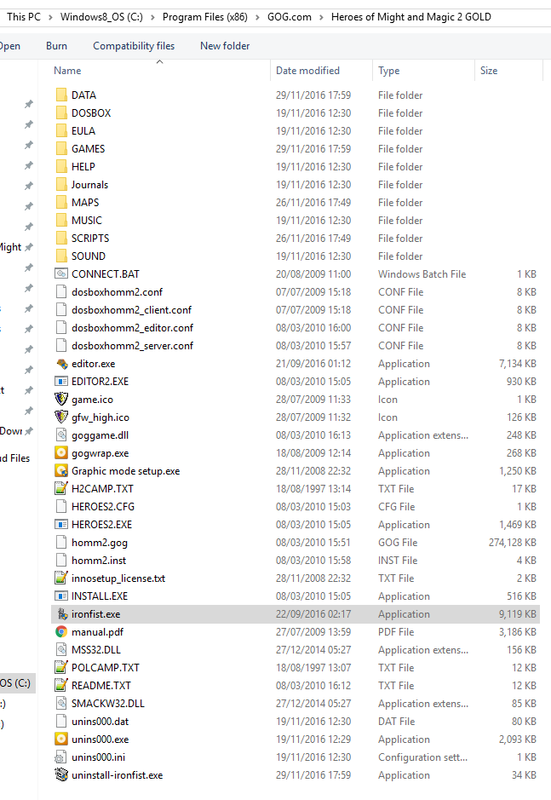 If you do not see that, then it means you installed it to the wrong folder, and you'll need to uninstall and try again. It is indeed installed in the correct folder, but I'll uninstall regardless and try again. Thanks for the help so far! I have had this issue a couple times in the past, and I am using the DOSBOX (GOG.com) version of HoMM II on Windows 10, just like you. What allowed me to get around this issue was to first, run ironfist.exe in compatibility mode--I had to do this with editor.exe as well, when I wanted to use the editor. After running the program in compatibility mode--windows version shouldn't matter--you should be able to run the program normally. If this does not work, let me know. I hope that this helps you. These occur upon fullscreen of either program. I've tried this using Windows 8, 7 and Vista. What settings are you using? I proceeded to run the executables normally, in Windows 10, after the compatibility mode workaround. Is this what you are doing? I'm not sure why, but it inserted my response as an edit into your last post. You probably clicked on edit instead of quote... probably. I've tried most combinations of compatibility versions, enabling comp mode and disabling it, but nothing seems to work. I should be getting a new machine soon, so I may have to leave this a while and try it there. Thanks for your help so far! You're very welcome. Let me know when you are able to get back to this. I stopped using compatibility mode after the first time. I now use regular Windows 10 "mode". I'll stay tuned and wait for your response. We'll get this figured out one way or another! I also have problems with launching- ironfist.exe and editor.exe. I installed Project Ironfist version 1.2.1 on three (3) different versions of Heroes 2 The Price of loyalty.Two of the versions are- FULL games with starting movies( one of them is a GOG version). The name of the file, I installed is "ironfist-install-1.2.1" . When I click on the file ironfist.exe, I receive a message- "" Ironfist .exe is not a valid Win32 applicaton". I receive the same message when click on editor.exe- "" Editor.exe is not a valid Win32 applicaton". My OS is Windows XP Service pack 3. Have you made sure that the target folder for the Ironfist installation is the exact same folder that you installed the original game to? Yes, I installed the game similar to VampMarcie, who wrote in that topic. My files are saved like he installed his, on the picture above. Finally, I found other, older verson of Project Ironfist that works. It is from here- http://www.homm2.com/ . It is 4,7 MB. The version 1.2.1 that do not work is 5,58 MB. Also, have you tried the solution that I suggested to VampMarcie? VampMarcie: When running Ironfist, make sure that you are using windowed fullscreen; this is achievable by clicking on the display tab in the top left of the window and selecting the corresponding option (NOT THE F4 OPTION) or by using the Windows "Maximize" function on the window. Also, I have noticed that using the legacy fullscreen option on Ironfist will lead to instability, and I don't recommend doing that right now. rafter: There is a bug that has been affecting some users with the installer; When you select the proper folder containing the copy of HoMM2, it may install Ironfist to a subfolder within the folder that you selected. Please make sure that this is not happening. If you use the "Browse..." button to select a folder, it may select the folder that you chose, but then it will add an additional subfolder name to the target path. Make sure that this subfolder name has not been added to the target path and that the very last folder in the path is the one that you have chosen to install Ironfist to. Feel free to let me know how things go! I'll be listening!